One of London's most famous murals - now a tad faded. 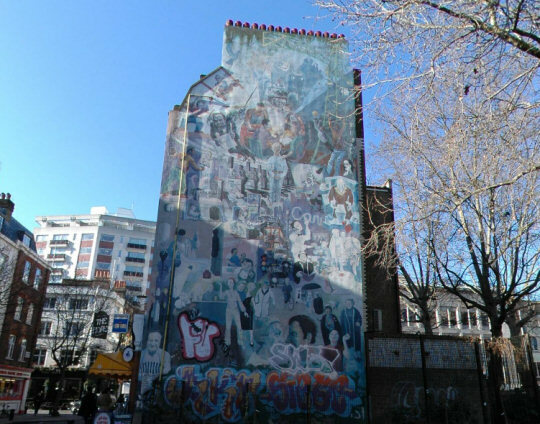 Description: This is the Fitzrovia Mural - over 60 feet high on the side of a house facing Tottenham Court Road and a tatty coffee house, showing many people at work and at leisure. 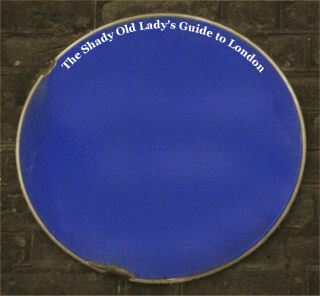 Mick 'Not the Clash one' Jones (who did the top half) and Simon Barber (who did the bottom), are the culprits. Joness half is an attack on large-scale developments, while Barber focuses on Fitzrovia as a place. It was painted in 1980 in a style resembling that of Diego Rivera. In 2005 12 Our Glass panels were erected in the gardens. 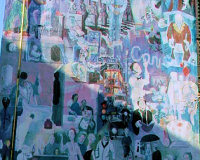 Each is about 5 feet high, with two sides showing a collage of people associated with the area, from satirical cartoonist William Hogarth to singer Boy George. There is 13th panel showing an index to the people.